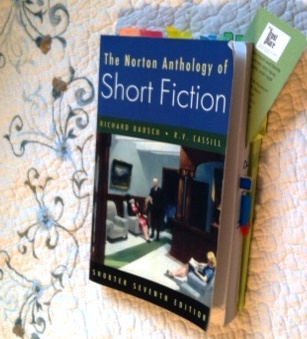 In front of me sits The Norton Anthology of Short Fiction, compiled by Richard Bausch and R. V. Cassill. Riddled with tags and sticky-notes, with a single bookmark from The Frost Place tucked into a page of no known consequence, it temps me. I must take care, or I will lose myself in the pages of this anthology. Last year, I studied stories from this book at the University of New Hampshire, under the tutelage of Alison Silverglad, Entering the class with a bias against short-stories, Ms. Silverglad’s selection of stories and classmate analyses expanded my understanding and appreciation for this literary form. Everyday Use by Alice Walker (1944 – ): Artistic rendering of time and place provide the appropriate backdrop for characters who exhibit quiet, deep strength. Sonny’s Blues by James Baldwin (1924-1987): This is about loving and letting go, acceptance of what cannot be controlled, communication and caring. Babylon Revisited by F. Scott Fitzgerald (1896-1940): Charlie Wales, recovering from great loss, interacts with the world left behind, to reunite with his daughter. Truly sad; truly inspiring. Hills Like White Elephants by Ernest Hemmingway (1899-1961): I cannot believe Ernest Hemmingway is on my list. After so many years of despising his work, I have learned to love this short story. My first reading of this plain, cryptic work left me cold. But having read it many times now, the symbolism, the characters, the words spoken and left unsaid, all create a powerful story. For those of you looking for more recent short stories, you might try Kiss Shot: Stories by Collin Kelley (@Collin Kelley). Let me know what you think. You can also check out Rara’s favorite books, the first of which is a short story by Roald Dahl. But be careful if you click Mr. Dahl’s link, because his website comes with music. 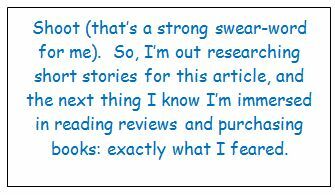 This entry was posted in Book Reviews, Reading and Writing, Weekly Brief and tagged Book Review, Everyday Use, F. Scott Fitzgerald, Hemmingway, Short Stories, Sonny's Blues. Bookmark the permalink.